Zippered mesh front opening large enough to hold a full sized basketball, soccer ball, volley ball or other sports equipment. Two mesh pockets on sides. Adjustable straps. Top carry handle. Dimensions 11.75W x 18H x 9L in. All hyped up for your next game? Make sure you didn't forget anything by packing them up in these?Customized Sporting Match Ball Backpacks. Available only in sporty Black color, these bags are guaranteed durable. Each bag has enough space to hold a?basketball, soccer ball, volley ball, or even a foot ball. Plus, the bags have other pockets where you can store your other belongings. Get started in designing these backpacks now. ?Upload your logo or slogan. If you don't have any ready image, get help from our DesignLab. We have lots of cliparts and fonts that you can use in your artwork. 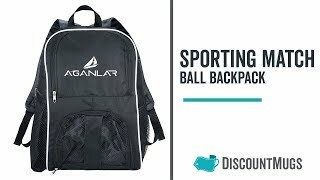 Purchase these wholesale?Sporting Match Ball Backpacks today to get huge savings and 110% price match guarantee.